The son of a woman killed at the hands of her abusive partner demanded answers about her post-mortem examination at an inquest into her death. 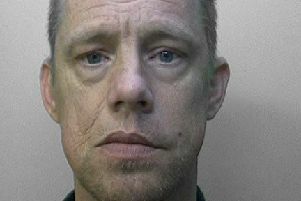 Robert Trigg was jailed for life last year for the manslaughter of Caroline Devlin at her home in Cranworth Road, Worthing, on Mother’s Day in 2006, and for murdering his other partner Susan Nicholson in 2011. Miss Devlin’s death was initially recorded by police as non-suspicious but unexplained, and on March 30, 2006, Dr Barbara Borek’s post-mortem examination at Worthing Hospital said she died of a brain haemorrhage. But after Ms Nicholson’s parents spent their life savings getting both deaths investigated, an expert forensic pathologist thought Miss Devlin’s death was due to a blow to the head. At Crawley Coroner’s Court on Tuesday, Miss Devlin’s son Brandyn McKenna asked why a forensic pathologist did not conduct his mother’s post-mortem examination in the first place. He claimed a dispute between Sussex Police and the coroner’s office about who would pay a £4,500 bill for a Home Office forensic pathologist to be brought in meant a local post-mortem was carried out instead. West Sussex senior coroner Penelope Schofield said she was ‘very sorry’ there ‘appeared to be some disagreement at the time of your mother’s death’, but assured Mr McKenna the ‘proper process had been followed’. The 21-year-old was a child when Trigg showed him his mother’s lifeless body on Mother’s Day. A poem by Miss Devlin called Motherhood was read at the inquest, which included the lines: ‘these four hearts that I have today / mean so much to me in so many a way’. After the inquest, Mr McKenna said it gave the family ‘a little bit of closure’, and police had told him the dispute was not a money issue and his question would be raised with their superiors. Recently it was announced that the Independent Office for Police Conduct, the police watchdog, will be reviewing Sussex Police’s conduct around Miss Devlin and Miss Nicholson’s deaths, and if any chances to bring Trigg to justice earlier were missed. Despite having a history of domestic abuse known to police, the killer was only imprisoned after Miss Nicholson’s parents spent £10,000 of their life savings to get a private prosecutor. The murder trial heard that in November 2003, more than two years before Miss Devlin’s death, Trigg punched and kicked his then-girlfriend in the head and face so badly she was hospitalised for three weeks, but only got a police caution. Click here to read more about the trial. This comes after Peter Skelton, Miss Nicholson’s father, said he ‘did not trust the police’ after news of the review came out. Click here to read more.